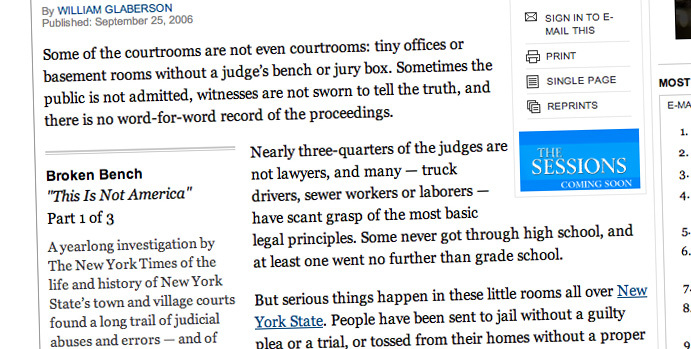 A screen shot of the New York Times' 2006 series taken from its website. In 2006, a newspaper report that documented abuses of law and power in New York’s town and village courts helped birth New Mexico In Depth. The newspaper also documented racism, political corruption, and ignorance of and disregard for the law. I was in awe of the work The Times put into the series. I remember thinking, this is what journalism should be. This is the sort of thoughtful, probative, fact-based reporting that helps people better understand the world in which they live. From the moment I read the first installment in The Times’ series, I started thinking about how I could do such journalism in New Mexico. Six years later, New Mexico In Depth is here. I don’t want to overpromise: New Mexico In Depth has a limited budget, and projects like that 2006 New York Times series require immense resources. But when I read that series, I was inspired and knew I wanted to focus my energy on the type of journalism that tackles big questions and complex issues. For New Mexico In Depth, that will often mean projects that take weeks or months to complete – and, hopefully, we’ll occasionally find time for a yearlong investigation. My colleague Trip Jennings and I are frequently asked what exactly New Mexico In Depth is going to do. If you’re familiar with the nonprofit news organization ProPublica, you’ll understand part. Like ProPublica does on a national level, we are going to be producing in-depth reports on issues in New Mexico. We will focus some of our energy on conventional, hard-hitting investigative reporting, but we will also devote resources to exploration of systems and cultural issues as we seek to better understand – and help New Mexicans understand – our state and how we can improve it. We plan to give our partner news organizations the first crack at publishing the reports we produce, then we will disseminate our work far and wide for publication by anyone. We want New Mexicans to have access to strong, thoughtful journalism regardless of where they live – or how they consume news. In addition to English, we’re working to provide versions of our in-depth reports in Spanish and, when useful, other languages. We hope to produce radio and, perhaps down the road, TV versions in addition to print versions. But New Mexico In Depth is more than a couple of journalists doing reporting. We’ll partner with other news organizations to help their reporters dig deeper. The media is still struggling through the transition to the Internet, and many organizations don’t have the resources to devote to strong contextual and investigative reporting. We’re currently building partnerships that will allow us to work with reporters at existing media outlets on large-scale projects. Our intent is to help give reporters time and resources to do more in-depth work. We expect that those who are already doing this will jump at the opportunity to do more of what they love. Others doing it for the first time will, we hope, develop new skills and find a passion for doing in-depth work. In short, our aim is to nurture a journalistic culture that helps our state address the many challenges it faces in the 21st Century. We’re really excited about this opportunity.